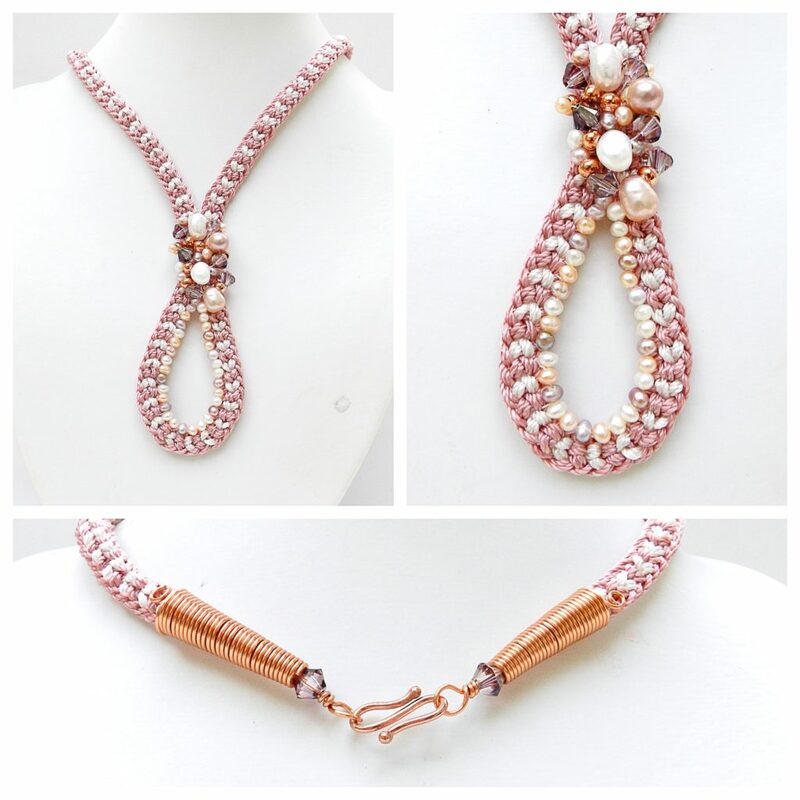 On 28.10.16 I demonstrated a multi-strand necklace using a lovely kit comprised of Swarovski bicones in 4mm and 6mm, large and small natural pearls, rose gold seed beads and S-Lon cord in all 3 sizes, in pink and cream. 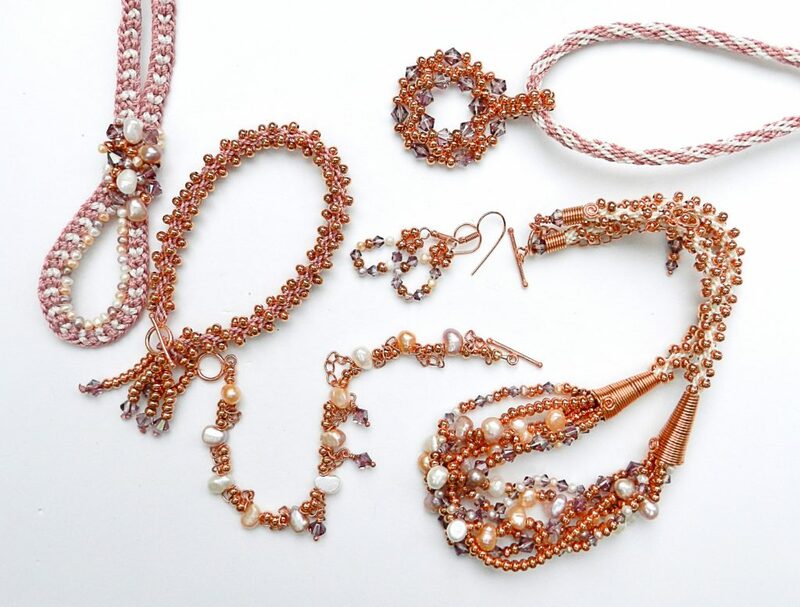 I used a combination of kumihimo and beadweaving techniques to make the designs. As my speciality is kumihimo I will only be providing instructions for the kumihimo. To view the show, click here. This demo starts at around 59 minutes into the recording. Cut 4 x 1.25m S-lon 0.3mm and 3 x 1.25m S-LON 0.9mm. Find the midpoint of the cords and tie a knot about 10cm to one side of this point. Thread a selection of beads onto the cords. The thinner cords are for the small pearls and 4mm bicones. The beaded sections should measure approximately 20cm. Tie all the cords together at the other end. Cut 2 x 1.5m S-Lon 0.9mm. Find the midpoint of these cords and tie them to one side of the beaded section. Thread a cone of wire onto the cords and position the cords on the disk. The 4 thin cords should be put all together in one slot and the two longer cords should be diagonally opposite on the disk. Thread 30 seed beads onto both of the two longer cords. Braid for 8 individual cord moves. Braid in a bead each time the cords with beads are moved until all the beads are used up. Check that the central beaded section as you want it. Tighten up any cords which have slipped. The cords can be loosely plaited or twisted. Repeat the braiding for the other side of the braid. 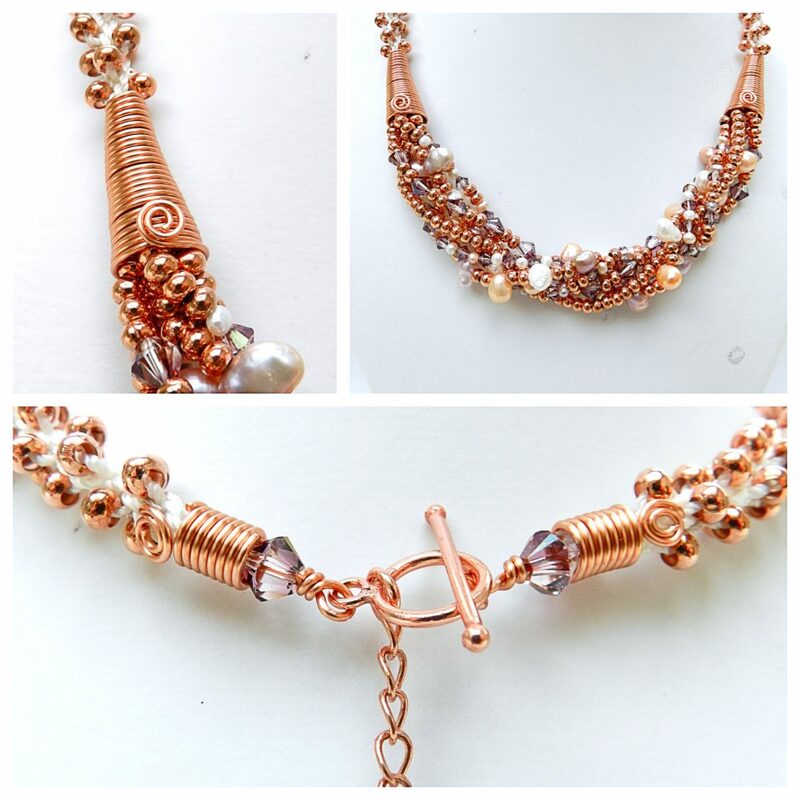 Finish off the ends with an end cap or coils of wire and a clasp. Cut 3 x 120cm and 1 x 160cm S-Lon 0.9mm. Thread all the cords through one side of the toggle clasp and centre the clasp on the cords. Position the cords on the kumihimo disk on either side of the north, south, east and west dots, making sure that the longer cords are diagonally opposite. Braid for 8 moves. Thread 30 beads onto the two longer cords. Braid in the beads until the bracelet is the required length. Lift 4 opposite cords from the disk and thread the other side of the clasp onto these cords. Lift the remaining cords from the disk and tie the cords in a double knot to secure the clasp. Apply a drop of glue to the knot. 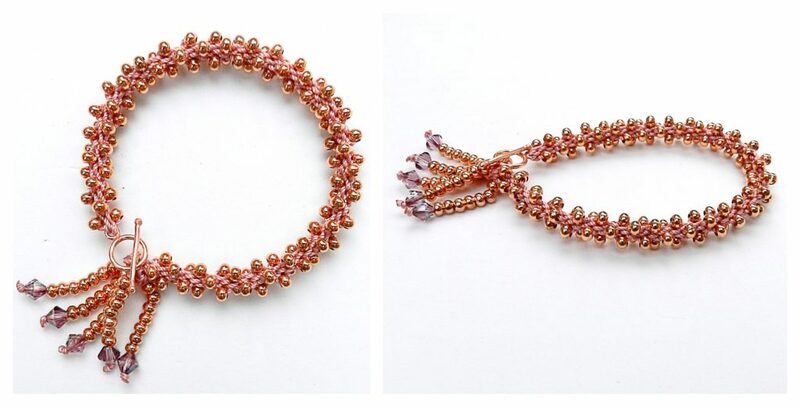 Thread seed beads onto pairs of cords, finishing off with a 6mm bicone, to create tassels. The braid is a Half Round Braid made with 2 cords in each slot. The white cords are in slots 8 and 25. The focal section is created by sewing beads onto the braid in a random design and stitching small pearls around the inside of the loop of the braid. This braid is 8 cord Round Braid and was made with two S-Lon 0.9mm cords in all 8 slots. 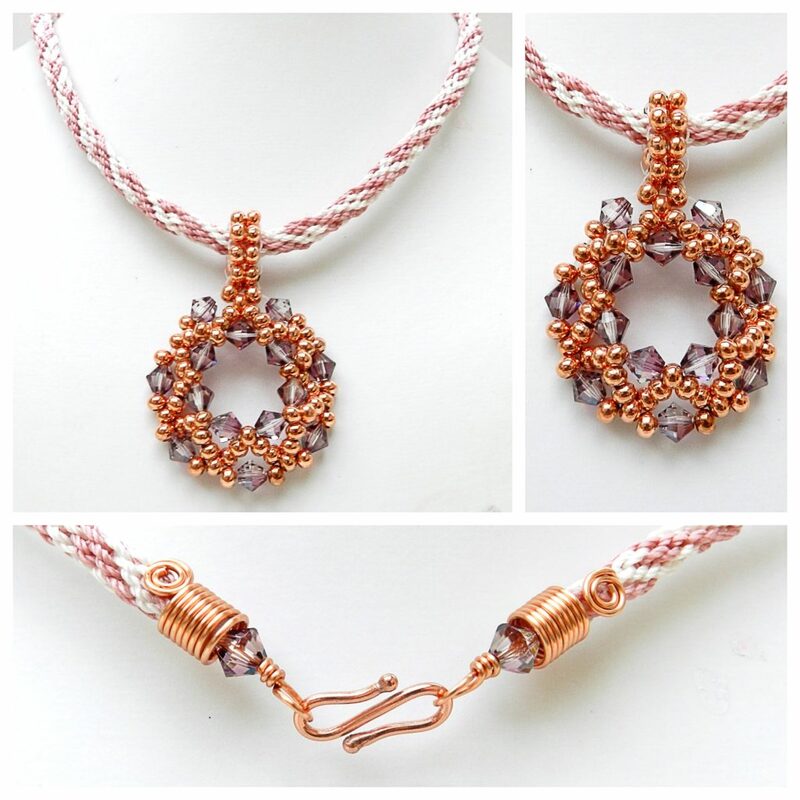 The pendant is a beadwoven design using the netting technique and 6mm Swarovski bicones with 4mm seed beads. 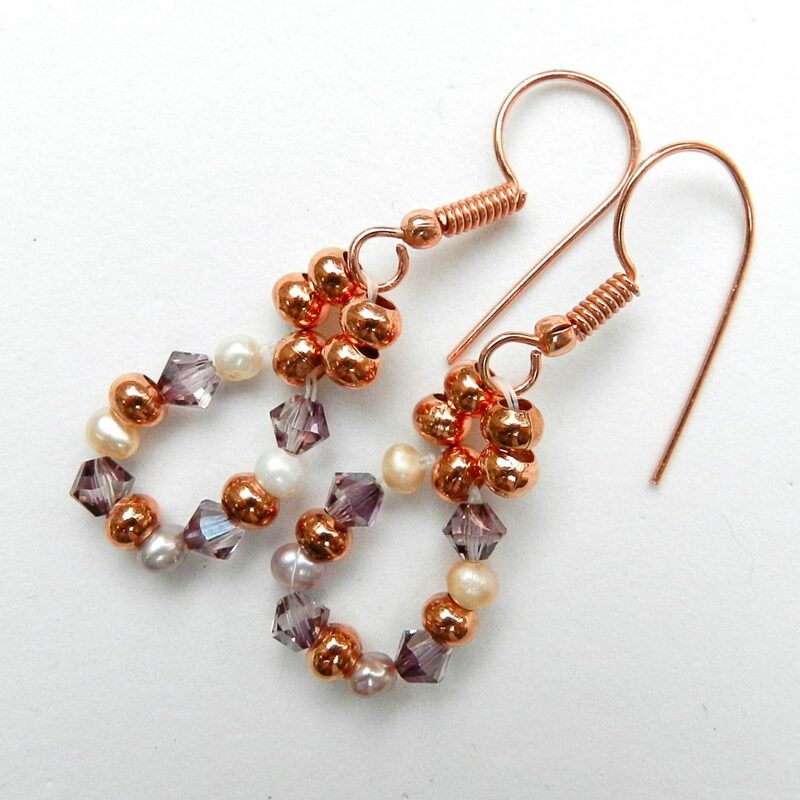 This is a simple design where seed beads and pearls are threaded onto beading wire. 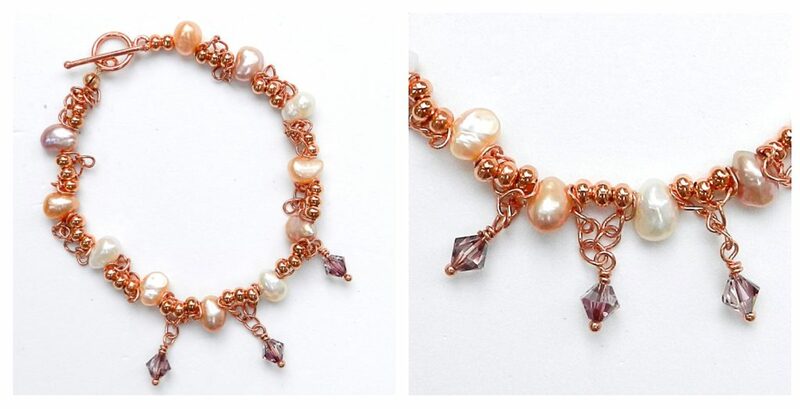 Chain is cut into 7 link lengths and threaded onto either side of the seed beads. Crystals are attached with wrapped loops.